It can be so frustrating to see a young squash developing on the vine, then it withers at the end and doesn't grow any larger. What causes that? In most cases, it's a pollination failure. 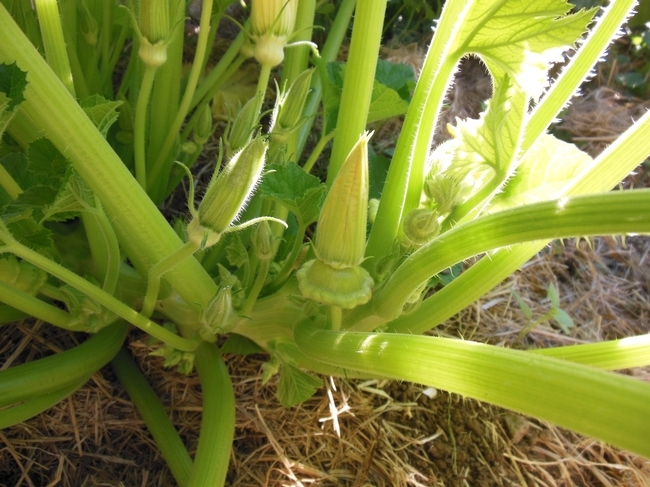 Squash, melons and cucumbers (cucurbits) have male and female flowers. Pollen in the male flower is sticky, so wind-blown pollination doesn't work and the plants need insects or human helpers to transfer pollen. There can also be a mismatch in timing if the female & male flowers aren't blooming simultaneously, so that pollination doesn't occur. How do you tell the difference between male and female flowers? The male flowers grow on slender, upright stalks and have a single stamen in the center of a flower. The female flowers have a swollen base (the beginning of your squash fruit) and the center of the flower has a cluster of anthers. In the photo, the female flower just above the baby pattypan is just about to bloom. The male flowers (above & left) are also about the bloom, so hopefully the timing will be right for successful pollination. If you don't have lots of insects moving pollen from flower to flower, you can help by using a small artist brush to dab pollen from the male to female flowers. Pretend you're a bee! And if you want to try squash flowers in your favorite recipe, be sure to choose the male flowers. We hope you have a bountiful squash harvest!